Male Elephant Seal with a harem groupWe don’t often think of California as looking anything like Africa, but California biodiversity ranks right up there in terms of evolutionary uniqueness and richness. And that’s true both on land and in the ocean, where you find, among other beasts unique to this coast, sea otters, gray whales, and northern elephant seals. The other day I went on a beach walk with my friend Bob Jones, the former preparator at UC’s Museum of Vertebrate Zoology who’s now retired. Bob has achieved some regional notoriety for being among the few people who are permitted to go out and retrieve dead marine mammals for museums. Whether on the beach or in the lab, he’s often elbow-deep in dead marine mammal. (Bob actually got his permit to work on marine mammals before the Marine Mammal Act in 1972; it’s otherwise a federal offense to mess with a marine mammal, dead or alive). Bob’s highly skilled at turning decaying carcass into bone-white, clean museum specimen, and his hands have prepared most of the marine mammal specimens in the MVZ’s skeleton collections over the last 35 years. Bob first introduced me to the wonders of Point Reyes when I started graduate school. Although I’m a paleontologist, our knowledge of the extinct organisms starts with their modern relatives. And for marine mammals, that’s as simple as a walk on the beach. Bob and I got to South Beach entrance at daybreak, and started marching south. It was a typical morning at the Seashore: overcast, foggy and the ocean swells were frothy. Our eyes scanned the beach for flotsam or, as is sometimes the case, pinnipeds lying asleep on the shore. After about a mile or two, we started to see large, rotund blobs lying on the beach a few hundred yards away from us. In the fog, they looked like brown sleeping bags – well, 16 foot sleeping bags. 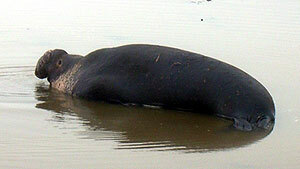 They were actually bull elephant seals (Mirounga angustirostris) hauled out on the shore. We carefully skirted around them, took notes and photos, and kept on walking. This is the time of year when elephant seals come back after six months of eating squid in the North Pacific, to both relax and mate. Elephant seals got their name from the males’ large, fleshy nose (proboscis) that looks a bit like a trunk. It’s not clear why they have such a nose, but it may help emit calls on land, helping males compete for females. Elephant seals are also among the heaviest carnivores in the world, weighing in over 5000 lbs – and when you see two males joust by slugging their toothy heads at one another, you can believe it. 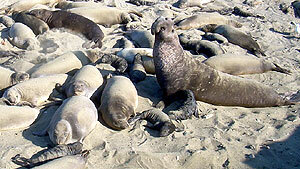 By midday we counted 14 elephant seals – 13 males and one female. Counts like ours are tabulated by the Seashore for the entire season, and then compared with previous seasons. When we included other pinnipeds we saw – a very sick California sea lion (Zalophus californianus), and the skeleton of a harbor seal (Phoca vitulina) – it adds up to 3/7 of the North Pacific pinniped fauna, all on a strip of beach 30 miles north of San Francisco. Who needs go to Africa to see big carnivores when the Serengeti of the ocean is right in our backyard? Nick Pyenson is a PhD candidate at the University of California, Berkeley, in the department of integrative biology and the museum of paleontology. It is a great site to see the elephant seals on the beach. Nick Pyenson is a paleobiologist and PhD candidate at the University of California, Berkeley, in the department of integrative biology and the museum of paleontology. Nick grew up in Canada and in Louisiana before moving to California for graduate school. He received a BS from Emory University and an AA from Oxford College of Emory University.